I’m not crazy about seafood. I don’t eat cheese or milk-based foods. And I don’t like most beans. But I love a great meal!!! Since living here in Sendai I’ve come across a number of restaurants, bakeries, and assorted other eateries that are perfect for me and my pickiness. My aim with this blog is twofold: 1) to help others like me (and normal people, too) find satisfying meals, 2) for others to help me by suggesting new places that I might like. Address: Kokusai Center Subway Station. Map: Check on their website. Saturday, July 1st from 10 am to 6 pm, and Sunday, July 2nd from 10 am to 4 pm. I stopped by late Sunday afternoon during last year’s festivities, and some of the gyoza booths had already sold out, while other stalls had lines that were more than a 40-minute wait. This proved to be an extremely popular event in 2016. Still, it was fun to sit, eat, and watch the crowd enjoy themselves. 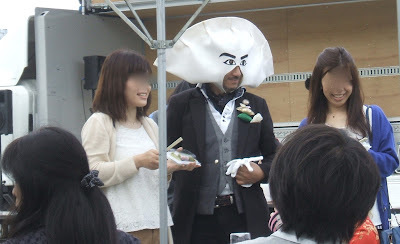 I also got a glimpse of Gyoza Man (?-I don’t know he calls himself). 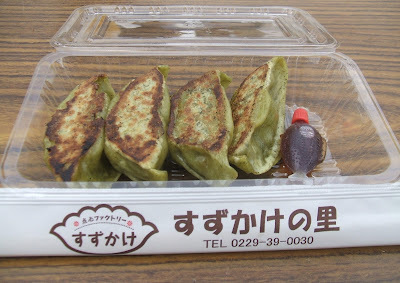 Gyoza Man? Mr. Gyoza Head? Kirin Beer is once again hosting this gyoza extravaganza and there are live performances scheduled throughout the event. 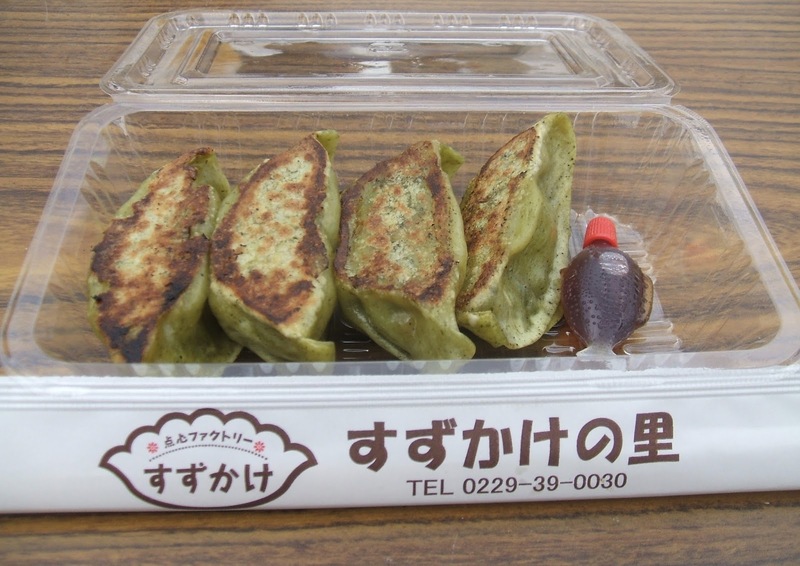 All the vendors are selling their gyoza packages for 300 yen, which are usually four dumplings per pack. I’m sorry, but I really don’t remember my impressions on the pot stickers from last year, but I’ll add a few photos just to give you an idea. I grew up with a ton of food allergies, some of which I still have. Also, I wasn’t introduced to a wide variety of foods as a child, which made me skeptical of any dish that looked “different.” Add these elements together and you get a picky eater. I’ve been searching for good grub, or at least what I consider “good,” since arriving in Sendai in 2000.